St. Patrick’s Day is almost upon us. As we all become Irish for the day, there are a few things to keep in mind while partying around the city. 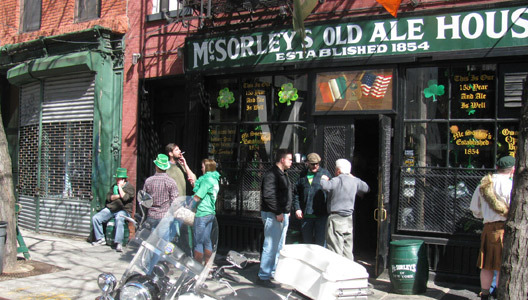 Whether you’ll be day drinking in a Brooklyn backyard or wandering around the Alphabet City Pub Crawl, keep these do’s and don’ts in mind to make the best on your luck of the Irish. DO: Wear Something Green. Get festive with your favorite olive button down, mint skinny jeans or a sparkly four-leaf clover headband. No matter the shade of green, proudly rock an outfit or accessory with the color of the day. DON’T: Mix Drinks. Remember that good ole’ college saying, “Liquor before beer: you’re in the clear, beer before liquor: never been sicker.” Don’t combine your green-themed mixed drinks with pints of Guinness. DO: Attend a Singles Mixer. Looking to get “lucky”? Attend a singles event on this alcoholiday! DON’T: Trust Your Green Tinted Beer Goggles. Just because his shirt says “Kiss me, I’m Irish”, you aren’t required to kiss every drunk leprechaun in the city. DO: Eat Your Corned Beef and Cabbage. Make sure to start the morning with a solid breakfast before imbibing. And don’t forget to snack throughout the day. Make sure to coat your stomach with enough food to ease your impending hangover. DON’T: Go to Murray Hill’s “Irish Bars”. There are only so many times you can hear U2 and Journey accompanied by a chorus of “shots, shots, shots” from all of the ex-frat boy revelers. It's really not fun, and it should be left to the off duty servicemen and Bridge and Tunnel kids looking to extend Hoboken's annual drunk fest. DO: Pace Yourself. When on a daytime drinking binge, the cheap specials and warm spring sun will entice you to throw back a few more than usual. Make sure to sip water in between cocktails to guarantee you’ll still be standing for last call. DO stay clear of 5th ave unless you don't mind being part of a human shamrock float.